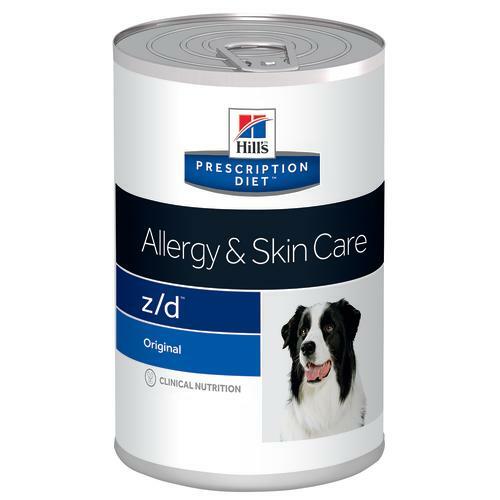 Prescription Diet Canine z/d ULTRA Allergen-Free has the following key benefits. Chicken liver hydrolysate, maize starch, cellulose, vegetable oil, minerals, vitamins, DL-methionine, trace elements, taurine, L-threonine, L-tryptophan. Beta-carotene 1 mg/kg, Calcium 0.002, Carbohydrate (NFE) 0.135, Fat 0.035, Fibre (crude) 0.012, Magnesium 0.0002, Moisture 0.755, Omega-3 fatty acids 0.0013, Omega-6 fatty acids 0.0098, Phosphorus 0.0014, Potassium 0.0016, Protein 0.05, Sodium 0.0005, Taurine 430 mg/kg, Vitamin A 8420 IU/kg, Vitamin C 25 mg/kg, Vitamin D 330 IU/kg, Vitamin E 160 mg/kg.